I've converted (tried to) an HVC-SLROM to HVC-SGROM, but I'm getting some lockups and resets. All I did on the CHR RAM part was to correctly route /CE, /OE and plugged /WE to pin 47. I have simply rewired the PRG ROM and the game (Rockman 2) boots and plays fine, except for these bugs. One part that always locks up or resets is te beginnig of Clashman's stage, when I need to kill that cylindrical enemies. Most of the time (around 95%) the game crashes or simply reboots in that part. This also happens in other stages, (I tried MetalMan, WoodMan and AirMan) but not always. I could say that the game always crashes on Crashman's stage!! That's the second time I get trouble in the same conversion. Am I missing something on the rewiring? If you don't notice any other visual anomalies, the CHR-RAM rework is extremely unlikely to be what's causing the crashes. What could cause this miss? I tought it was something related to the ROM being accidentally disabled, so I gounded /CE and let the mapper control /OE only, but got nothing different. Without any other data? My blind guess is it's something wrong with the PRG ROM you used. something wrong with the PRG ROM you used. I suspect this too. And also did the other time this happened. The other time, it was with Chris Covell's Bionic Commando patch. I checked and reflashed many times with the same results. In the end it worked fine with the board I have that have no mirroring control circuit. That's why I think there's something wrong with my wiring. By the way, I'm using this (re)translation. I'm not sure if I've tested it extensivelly in emulators, since I've flashed the ROM sometime ago and just now I had time to put the things together. Interestingly, looking at one schematics I have, I saw a 27K pulldown in CPU A14. I added it and cured the CrashMan's crash, but I still get a reset when I shoot AirMan. I've made some more tests and looks like I was barking the wrong tree! I tried the same game in 2 other clones I have and it worked fine. I could even arrive at the 2nd stage of Willy's fortress. Looks like the clone I was using is the problem. I tried some other games and misteriuosly Gradius don't boots too. Interestingly after a tough clean Gradius started to boot. But it always displays the Konami one Gradius ten screen, even with no controllers attached. Another weird thing is that it sits at title screen, when it should go to a demo it just beeps and come back. Would all this be caused by some joystick I/O malfunction? Any suggestions of where to start looking are welcome! Edit: Added the newer findings. maybe the default power up values of RAM? maybe open bus behaving in ways different from how the real famicom does? Could it be some problem with the buffer (the 74'368)? Shouldn't M2 go through a buffer? This clone seems to have M2 routed directly to the joystick connectors. My bad! I had incorrectly viewed the schematics! And I can't explain exactly what. But I think I saw M2 go to the joysticks through a buffer. Maybe the schematic was wrong, or I was daydreaming. You're not wrong: what the famicom schematic calls 4016CUP and 4017CUP are high-impedance with an external weak pullup most of the time, and then strongly pulled high (φ1) then low (φ2) during the CPU cycle that actively reads from the joystick. But the logic that goes into that is more the "address bus = $4016 and r/w=Read" than the M2 part. Interesting. Thanks for the info! I tend to use the Famicom schematic's as reference, that explains it. 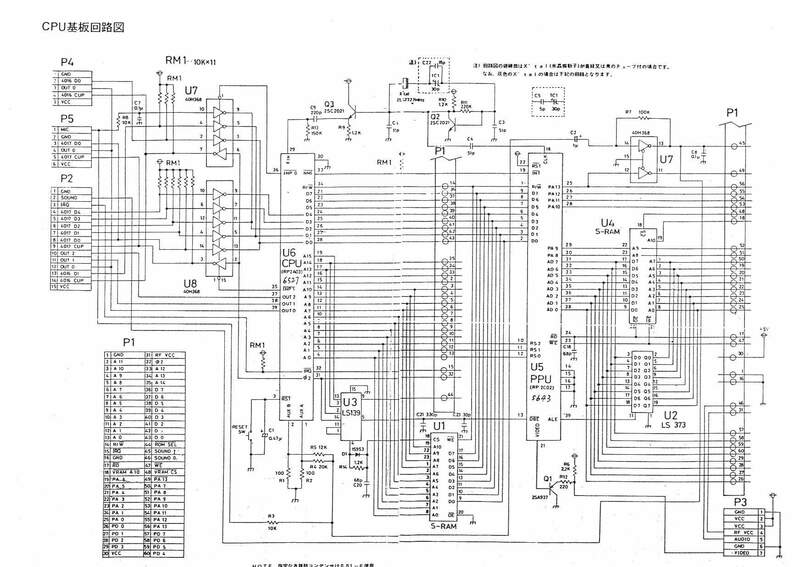 I think this clone's schematics is very similar to the NES, it even resets the PPU when the CPU is reset. The weird things I noticed is that it has audio, composite video and CPU A15 on the cartridge connector. What do you think about it's similarities? Tomorrow I'll try to remove the buffer and see what happens. I think it may be it or something strange is going on the mainboard. That Gradius cartridge I have used to work fine in that clone. Maybe I should open another thread, since the problem is not the repro, but the clone. I removed both joystick buffers and the problem persists. Edit: Since this problem isn't related to reproduction anymore, I thought it would be better to discuss it here. Yes, I opted to "ressurect" an old thread rather than starting another one. Hope someone can help me so solve this very obscure problem.